Stunning Traditional Design: This Stunning Traditional Vintage Style MDF Board Wall Clock is certain to be an attractive addition to your home and can be integrated to compliment almost any Decor. Ultra Silent: Silent Non-ticking, the round skeleton clock has high quality quartz battery operated movement, help you to achieve a quiet sleep and learning space. 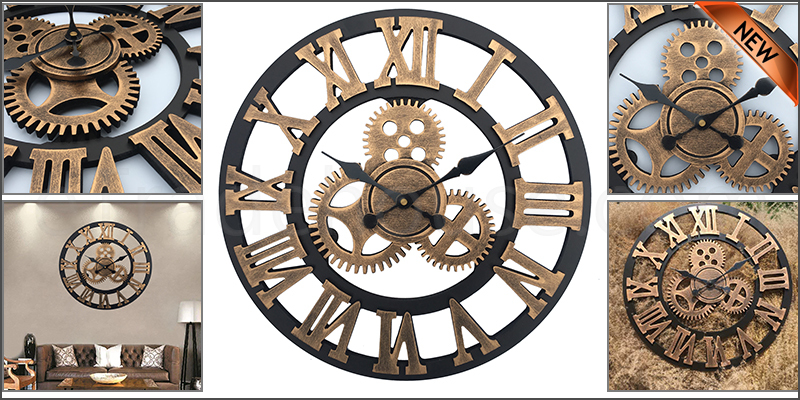 Exquisite Craft: Perfect Cutting of gears and 3D Roman Numerals, this Retro Clock is made of MDF Board. This clock features a Vintage open back skeleton frame design and surrounding Roman Numerals with a distressed finish.